Sparklers are showing up at almost every wedding these days. The most popular to ending wedding photos are the sparkler send-off line. For me knowing the technicality of wedding photography, I like to step out of the comfort zone by asking my clients if they would like for me to create this type of sparklers image either before or after capturing the sparkler exit send off line. This is the most requested after photos from many of my clients, what I call the LOVE writing in the air. Just like this spectacular LOVE sparklers wedding images that I captured at the Westin Resort and Spa in Hilton Head, SC. 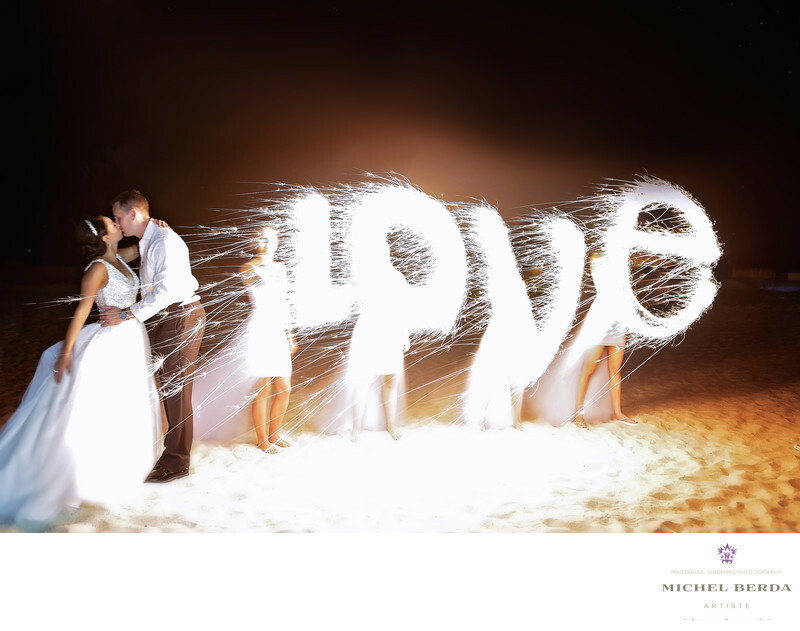 It’s a big growing trend in wedding photography these days to do this type of sparklers image. They are extremely versatile and can be that fun, and a magical element that adds a special spark to make your wedding shine! Whether you have an elegant or rustic theme, you can make sparklers work to give you that loving image you have always dreamed of. The elegance is enchanting which adds a perfect mood and character to your final image in the album. I love creating different wedding images for my clients, my style is always to be unique in every wedding by pushing the envelope to give every client a different wedding photography image. Take this image captured at The Westin Resort & Spa in Hilton Head, South Carolina. The bride and groom wanted to have the bridesmaids in the photo, before the exit with the sparklers, I came up with this theme by using the word LOVE with the sparklers. This added such a powerful wedding image including the couple kissing and being well exposed. The Westin Resort & Spa in Hilton Head, South Carolina loved it so much that it made it to The Westin Twitter page. This photo literally has spread like wildfire sending me many wedding clients that love this image so much, that they are also asking me to create this type of images for their wedding. Keywords: love sparklers (3), sparklers (3), sparklers wedding photography (3), Wedding Photographer (1254), wedding photographer hilton head sc (6), wedding photographer westin resort and spa in hilton head sc (3), Wedding Photographers (198), wedding photography sparklers (3), wedding sparklers (3), westin resort and spa in hilton head sc (3).